Hurricane Season is here! Are you prepared?! Evacuating in an emergency situation can be both chaotic and stressful.With experts anticipating this to be one of the most active storm seasons we have seen in several years, we want to encourage all of our clients to take a few minutes to make sure that they are prepared to travel safely with their pets. Food and water- Make sure you have a large supply of food and water for you pet, preferably a whole month’s worth. Two forms of ID for your pet- Tags with current information, displayed on either a halter or collar, along with a microchip are highly recommended. It is also recommended that there is contact information on file at your microchip company for a friend who lives outside the affected area, so if your pet is found, contact can be made quickly even if your cell is out of power or other local disruptions exist. Medication- Don’t forget your pet’s prescription meds. Medications can sometime be critical to your pet’s health and can be hard to replace. We recommend at least a two-week supply. This includes all anxiety medications or sedatives that your pet might need while traveling. Vaccination records- In case you need to board your pet or use public transportation during the course of your evacuation, these may come in handy. It would be ideal to scan a basic health certificate and keep it online for easy access. Pet care basics– This includes the everyday items you’re likely to overlook, like food and water dishes, leashes, litterboxes, chew toys, etc. Evacuating with pets can be stressful & chaotic. Make sure you are prepared! Make sure that you have a safe place in mind for both you and your pets in the event of a storm. 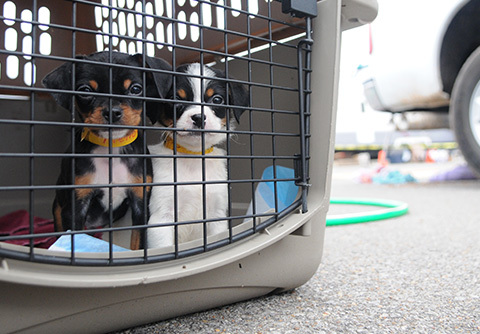 During a crisis, public disaster shelters and hotels may (or may not) allow pets. If possible, call ahead so you know if you must make other arrangements to avoid you and your pet being stranded in the face of an emergency. Please note that the clinic will not be open in the event of a mandatory evacuation and we will not have staff here to care for your pets. Do not wait until the last minute to make sure that you have the supplies that you need for your pets in the event of evacuation. Local stores may run out of carriers or other essential items. Check your medicine cabinets and make sure that you have a reasonable supply of your pets medications so that you are not scrambling to get refills at the last minute. We want to make sure that all of our patients have what they need to evacuate safely. As disaster approaches, bring all pets into the house so you won’t have to search for them if you need to leave quickly. If you need any refills of medications, sedatives for travel or a copy of your pet’s vaccination records, contact the clinic at 281-282-9944.